Today, we climbed some ladders! 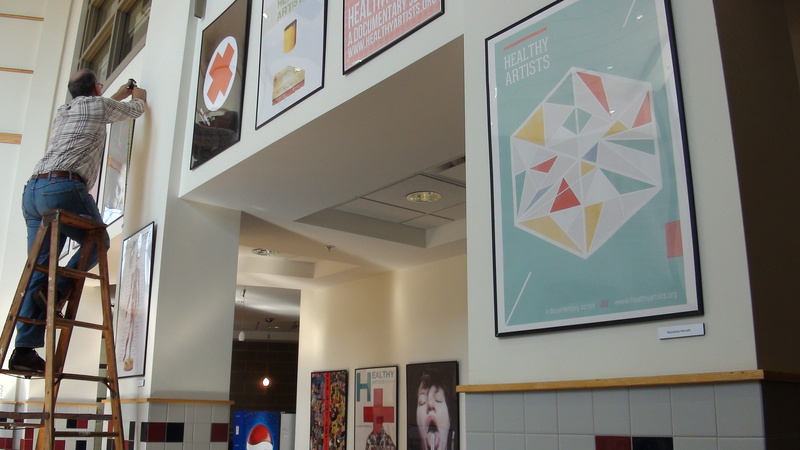 It was installation day for our Healthy Artists poster show in preparation for Pittsburgh’s first ever HE-HO Fair! HE-HO is a Health and Housing Fair for Artists that will take place from noon to 6pm on November 16th 2013. Come and enjoy free workshops on all things health and housing. For example, you’ll get essential info on how to score affordable, quality health care through the new Affordable Care Act marketplace. There will also be bands, delicious foods, prizes, and more! See the full program here. Visit our posters from now until late November at the Kingsley Association. Founded in 1893, Kingsley provides crucial services to working class families of Pittsburgh. To this day, it is a lively community center providing services such as health and wellness (e.g. – see their awesome list of tai chi and yoga classes!) to rejuvenate Pittsburgh’s Larimer community. Thanks again to GPAC (Greater Pittsburgh Arts Council) for hosting the event and expert art installer, Erin O’Neill, for lending us his extreme skills!